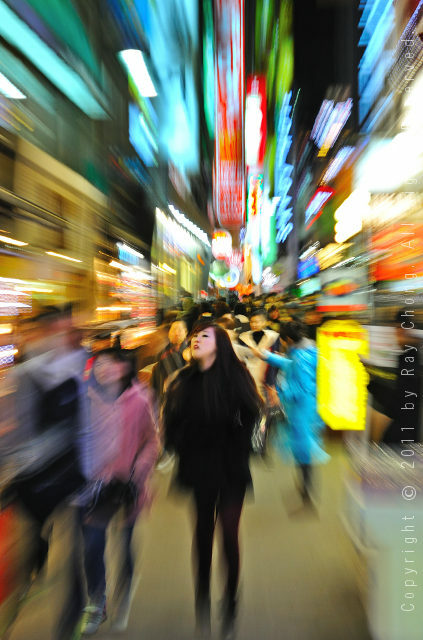 I made this image on my walk up Namsan on our last afternoon in Seoul. I had come to the mountain hoping to catch the twinkling city lights set against the afterglow of sunset, the way it had looked when a friend took us to dinner a couple of evenings before. But it was not to be. The prevailing winds had brought in an extreme haze over the course of the afternoon. Nonetheless, I was not displeased, for there were some interesting tones and silhouettes to gaze upon. To isolate a portion of the skyline, I used a longish focal length of 170mm. The shutter was tripped at 1/500 second with the aperture set to f/9.5, handheld. As with most of my pics, what you see is basically what I saw; “Fill the Frame” is a personal mantra. This image required very little processing – I only applied a teeny bit of contrast and tone adjustment to punch things up a bit. 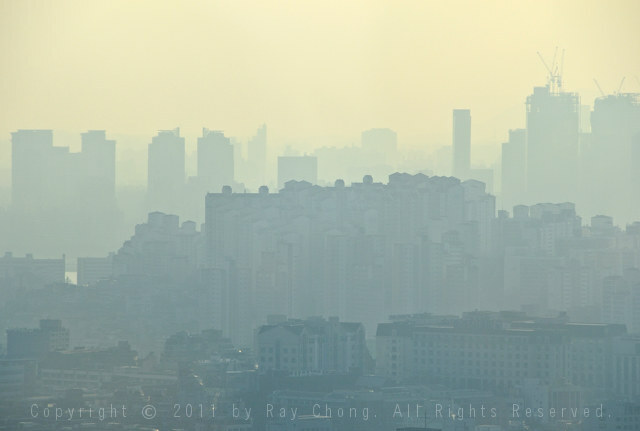 My trip to Seoul was bookended by very different weather: (very) cold and clear, then warm and (very) hazy. 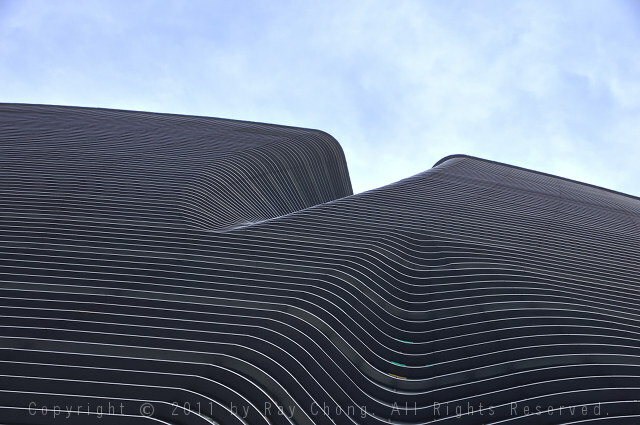 While wandering around the Insadong art district on the first day, we came across a pair of fabulous steel and glass structures with beautiful organic lines – the Twin Trees (aka Twin Tree Towers) by local architect Byoung Soo Cho. This is how Gattaca came about. I’ve been to some pretty romantic places in my travels. But on a hill outside downtown Seoul, I witnessed something that I will not forget for a long, long time. The location is the base of the TV tower on the top of Namsan (South Mountain), overlooking the city. Ancient legend has it that couples who came to the shrine would have their wishes granted. Fast forward several hundred years. The shrine has now been replaced by an elevated lookout platform and here – along its perimeter – run the world-famous cable fences, gaily festooned with thousands upon thousands of apparently abandoned padlocks. Let me explain. The locks are symbolic – of love and hope and promise – proclaimed in this romantic place; lovers locked to each other forever. Every day, couples show up with shiny padlocks in hand. On these locks (usually festooned with rubber plaques), they pen their hopes and promises to each other. Then they carefully select a location on the wall and it is to this special spot – high above the noise and bustle of one of the world’s largest cities – that they fasten their proclamations of love. Love that is undying, lovers bound together eternally. Several times during sunset on that evening, I witnessed the earnest scribbling, the careful choosing, and that final, lingering, click. The tenderness and innocence of this unencumbered love etched itself into my being. 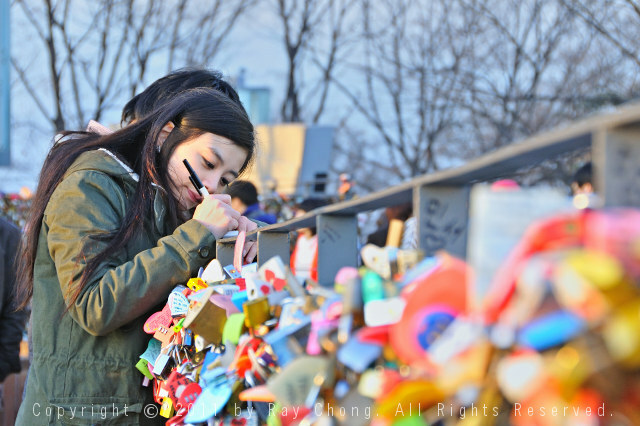 I came to Namsan fully expecting to document the well-known lock walls. I departed with so much more. Patience was the name of the game for this location. I arrived about 45 minutes before sunset; there were so many visitors that it seemed like it was going to be impossible to isolate a special pair. But somehow, I lucked out and during a lull in the stream of bodies, I spied this couple lovingly penning their thoughts. I snapped a few, then moved on. As fate would have it, I managed to catch them again as they secured their lock. I used a relatively long focal length to make these images. Focusing on their faces and using a relatively wide aperture allowed me to isolate them, while leaving in enough detail to communicate what exists in the out-of-focus bits. In both images, their backs were to the waning sun. I thus overexposed by ⅔ stops to better illuminate their faces. This turned out to be adequate, but was not really to my liking so I selectively adjusted the exposure a bit more during processing. I also performed a teeny bit of tone mapping to bring out some richness in the sky (it was very, very hazy that day). The COEX mall in Seoul is Asia’s largest underground shopping mall. 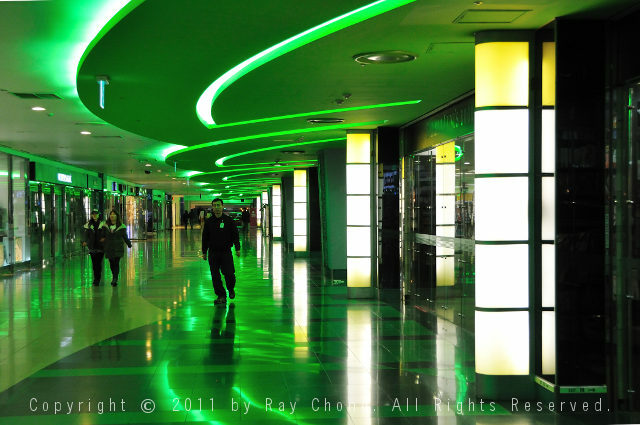 While wandering through one day, I spied this area with fabulous green lighting. Needless to say, I had to go back with camera in hand. 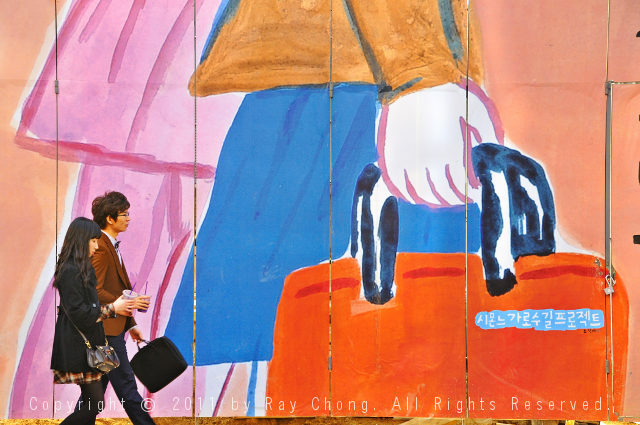 I wandered around the trendy Apgujeong area of Seoul on a beautiful, sunny winter afternoon. Spied this couple strolling past a construction site and couldn’t help but make a few exposures. 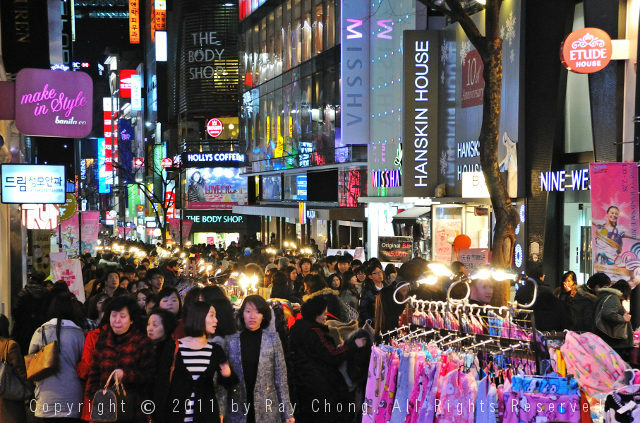 Myeongdong is one of Seoul’s busiest night spots. 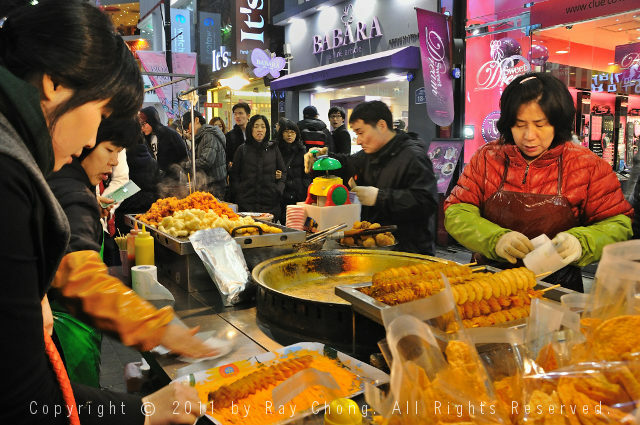 Regardless of time of year, when the sun drops below the horizon, the vendors fill the streets and the people come out to eat, shop and play. With these images, I have tried to show what it’s like in this popular area, where the hustle and bustle seems to go as far as the eye can see.